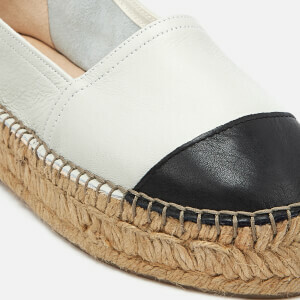 Women's 'Mellow' espadrilles from Kurt Geiger London. Crafted with a white leather upper, the slip-on shoes comprise a contrasting toecap, classic stitched detailing and a chunky jute sole. Branding to the footbed. Upper: Leather. Lining: Textile. Sole: Jute Rope.